There are many independent access points in the market ideal for small business, home businesses. When it comes to mid-sized enterprises, a single access point does not suffice; there needs to be a network of access points providing wireless connectivity to the employees. This is where a product like the Netgear WNAP320 becomes significant. This unit supports Netgear’swireless controller which allows the management of multiple access points to create a homogeneous wireless network within the enterprise. Wireless Specifications: WNAP320 is a single band wireless N access point that supports 802.11g as well as 802.11b standards. It can support throughputs of around 150Mbps, which is pretty significant jump from the 54Mbps theoretical limit for the 802.11g standard. With the backward compatibility, this access point can support older wireless devices as well as the latest models giving a good platform for the enterprise to upgrade the network gradually. Besides these multiple standards, the WNAP320 also supports Wireless Multimedia (WMM). This allows prioritization of traffic to ensure real time and delay sensitive information is given greater priority in the transmission over plain data. This helps ensure equitable distribution of the available bandwidth thereby enhancing the wireless network performance. One if the biggest advantages of this access point is that it supports 802.3af or Power over Ethernet (PoE) standard. This aspect allows the access point to draw power from the Ethernet port directly rather than rely on a separate power supply. As a result, this access point can be placed in the most optimal location for best coverage and connectivity without the limitation of having to place it close to a power outlet – this allows a lot of flexibility in the wireless network planning and design which is invaluable to any network administrator. Network Management: This is probably the most important feature of WNAP320 that differentiates it from the other products in the market and qualifies it for a mid-sized enterprise use. The access point supports SNMP so it can actually be managed by a network management system. Besides this option, it also supports the typical web browser based setup screen and telnet option for CLI management. When deployed with Netgear Wireless Controller (WC7520) the network can be expanded to support nearly 150 access points giving a complete coverage for a medium business operation. Access Point Mode: This is the most standard operation mode where the access point is the central node to which all the wireless devices connect. This access point connects to the internet over its Gigabit Ethernet port. This mode is best suited when the access point is used as a standalone access node. Typically, small offices with a handful of wireless devices would prefer to operate WNAP320 in this mode. Point to Point Bridge Mode: In this operation mode, the access point can connect to one other access point and form a two node network. Typically, if the enterprise network just needs to cover a larger area and is not able to do so with a single access point, this is a good option to adopt. In this mode though, both access points would act as bridges in the network. Point to multipoint Bridged Mode: This mode is more commonly used in complex wireless networks where point to point solutions would not solve the connectivity problem. Typically, when there are more than a couple access points, it is best to configure at least one of them in this mode. This would ensure that at least one access point can talk to more than one other access point. The devices at the edge of the network would still be configured as point to point, as they would typically talk to just one other access point. Repeater Mode: In this mode the device does not act as an access point at all. It is merely a repeater that helps connect other stations to the root access point whose coverage it extends. Client Mode: This mode is very similar to point to point mode, with the only difference that access point does not act as a bridge. It acts as a wireless interface for wired Ethernet devices like gaming consoles. Configuration Settings: The default IP address for the access point is 192.168.0.100 and the DHCP client is disabled. Hence, the only way to connect and configure the access point is by connecting it to a computer directly. While connecting to the access point, it is important that the computer is in the same subnet as the access point; hence it must be given a static IP address in the same range say something like 192.168.0.210 with a subnet mask of 255.255.255.0. Follow the steps below to access the configuration menu. Power up the access point and connect it to the computer. Web management interface is launched with all the configuration tabs. 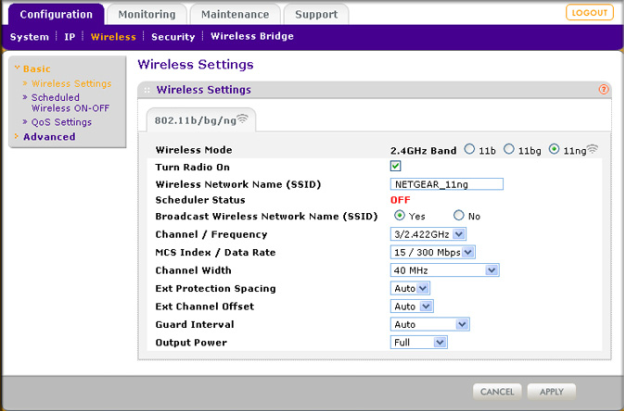 To configure the wireless network specifications click on the Wireless tab.